Why we offer buprenorphine treatment? Throughout Dr. Li’s professional career as a pain management physician, he has encountered numerous patients who were started on opioid pain medications inappropriately for chronic pain. Not only these patients did not benefit from these medications for the purpose of pain management, they ironically developed lower pain sensation threshold and became more sensitive to pain. This phenomenon is a medically known as “opioid-induced hyperalgesia”. Dr. Li believes in a comprehensive approach to treating chronic, refractory pain conditions that encompasses all treatment modalities available. On the other hand, an opioid pain medication should be prescribed only for certain indications. Another common and dread consequence of treating chronic pain with opioid medications is opioid addiction. Dr. Li has seen the burden of opioid addiction on patients and their families, whether from oxycontin, oxycodone, hydrocodone, even methadone, or heroine. Fortunately, with the availability of buprenorphine (subutex) or buprenorphine/naloxone (suboxone), he has been able to offer effective treatment for opioid addiction in the privacy of a physician’s office. For some common FAQs on opioid addiction and buprenorphine treatment for opioid addiction, please click on the tabs below and read more on this topic. What are Addiction, Physical Dependence and Tolerance? The American Academy of Pain Medicine (AAPM), American Pain Society (APS), American Society of Addiction Medicine (ASAM), and NAABT recognizes these definitions below as the current accepted definitions. In summary, physical dependence and tolerance are normal physiology. Addiction is uncontrollable compulsive behavior caused by alterations of parts of the brain from repeated exposure to high euphoric responses. Addiction is a disorder that is damaging and requires treatment. An example is a patient who suffers from severe chronic pain due to a terminal cancer might require a large amount of opioid-based pain medication. The patient will become tolerant and dependent on the opioid pain medications, but they are not necessarily addicted to the opioid medication. They will most likely experience withdrawal symptoms if abruptly stop the opioid medications (therefore have physical dependence on the opioid medication), but they will not seek out medication if no longer needed for pain control. Why is the opioid addiction a brain disease? Opioid addiction develops from fundamental, long-term changes to the structure and functioning of the brain. Scientists classify addiction as a chronic disease because areas of the brain are altered from the normal healthy state in long-lasting ways. These are physical changes to the brain that influence behavior – not caused by poor morals, controlled by willpower, nor cured by good advice. It’s a disease as is diabetes or cancer, and it is treatable. At the correct dose, buprenorphine may suppress cravings and withdrawal symptoms and block the effects of other opioids. Buprenorphine (´bu•pre•´nôr•fen) is not new. It was first patented in 1969 and has been used in the U.S. to treat pain and in Europe to treat pain and opioid addiction for over 20 year. Buprenorphine is a semi-synthetic opioid and is a partial agonist. Opioid Agonists are drugs that cause an opioid effect like heroin, oxycodone, hydrocodone, and methadone. Opioid Antagonists are drugs that block and reverse the effects of agonist drugs. Narcan ® is an antagonist and is used to reverse heroin overdoses. Buprenorphine can act as both an agonist and antagonist. It attaches to the opioid receptors but only activates them partially, enough to suppress withdrawal and cravings, but not enough to cause extreme euphoria in opioid-tolerant patients. 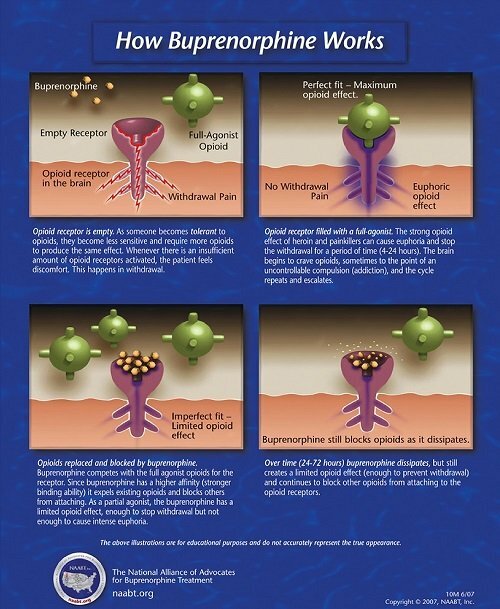 When all available receptors are occupied with buprenorphine, no additional opioid effect is produced by taking more. This is called the ‘ceiling effect’. The antagonist property of the medication expels, replaces and blocks other opioids from the opioid receptor sites. Therefore, if the patient decides to misuse opioid drugs after taking buprenorphine, the effects can be blocked, depending on dosage. Alternately, if buprenorphine is taken too soon after other opioids, by an opioid-physically dependent patient, the buprenorphine can precipitate withdrawal. The ceiling effect, blocking ability, and possibility of precipitating withdrawal, contribute to buprenorphine having a favorable safety profile and helps lower the risk of overdose and misuse. theFDA approved generic Bup and Bup/Nx sublingual tablets and the brand-name Bup/Nx sublingual tablet calledZubsolv®*. Both Suboxone and Subutex tablets were discontinued and replaced with Suboxone Film® which is a Bup/Nx sublingual film. The purpose for the addition of naloxone is to reduce the risk of misuse by injection. If the Bup/Nx combination is injected, the naloxone will help cause immediate withdrawal symptoms in opioid-physically dependent people. However, naloxone is poorly absorbed sublingually. Therefore, when taken as directed, very little naloxone enters the blood. Normally, patients are unaffected by the presence of it, and it is considered clinically insignificant. How long should buprenorphine treatment last? patient’s struggle for recovery is in great part a struggle to overcome the effects of these changes. Brain adaptations take time to develop and take time to reverse. Patients should remain in treatment long enough to reverse the brain changes to the extent possible and learn coping mechanisms for what cannot be reversed. This is accomplished through a deliberate reconditioning effort. Duration of treatment varies from patient to patient. The usual timeframe from Dr. Li’s experience varies from 6 months to a year, but some patients often require longer treatment to minimize the risk of relapse. What is the benefit of Buprenorphine/Naloxone (suboxone) treatment? No need to go to a special clinic. Buprenorphine may be prescribed by qualified physicians in private practice, protecting your privacy. Milder withdrawal and detoxification process than with traditional methods. Long lasting. Once maintained, the frequency of prescription is determined by the physician and can vary from weekly to monthly, depending on the patient’s needs. Safer than heroin or traditional prescription opioids. Buprenorphine alone is unlikely to result in an overdose. Reduced health risks, especially for those currently injecting drugs. Lower risk profile than methadone. Unlike methadone, Buprenorphine can be prescribed by physicians in private practice with specialized training and certification. Our office follows the strict guidelines and requirements of Confidentiality of Alcohol and Drug Dependence Patient Records. The confidentiality of alcohol and drug dependence patient records maintained by a practice/program are protected by federal law and regulations. Generally, the practice/program may not say to a person outside the practice/program that a patient attends the practice/program, or disclose any information identifying a patient as being alcohol or drug dependent unless: The patient consents in writing; The disclosure is allowed by a court order, or The disclosure is made to medical personnel in a medical emergency or to qualified personnel for research, audit, or practice/program evaluation. How we offer buprenorphine treatment? There are four steps in receiving an effective buprenorphine treatment at our office. Dr. Li will evaluate and determine if the patient is a qualified candidate for office-based opiate addiction treatment with buprenorphine. The patient will be prescribed laboratory tests to obtain appropriate laboratory testing, such as blood chemistry, urine toxicology, liver function study and pregnancy test if necessary, prior to starting the treatment. If the patient is determined to be a good candidate for in-office buprenorphine treatment, Dr. Li will determine if the patient should be treated either buprenorphine (Subutex) or buprenorphine/naloxone (Suboxone). The patient will be prescribed for Suboxone, or Subutex to bring in to the following induction appointment. The patient will also be given specific and complete instruction to follow for at least 72 hours prior to the following induction appointment. In-office induction will be provided and the patient will be monitored in our office. Patient will be required to abstain from opiate use for 12-72 hours, dependent on the type of opiate the patient has been using. Clinical Opiate Withdrawal Scale (COWS) will be used to monitor the patient’s withdrawal condition and determine the appropriate dosage of suboxone/subtutex for the induction phase. Stabilization occurs in the 6-8 weeks following induction. This period begins when the patient is no longer experiencing withdrawal symptoms or intense cravings. The main goal of stabilization is to eliminate opioid use, as noted by patient reports and confirmed by urine drug testing. The maintenance phase lasts anywhere from six months, a year to longer. During this phase, the patient is maintained at a comfortable dose and reports minimal craving or side effects. At an ideal daily dose, the patient should not experience neither withdrawal symptoms nor cravings. Medication adjustment, urine toxicology monitoring, pregnancy test for women of childbearing age, liver function test and Clinical Opiate Withdrawal (COWS) will be conducted during regular office visits during maintenance phase. Successful treatment of opioid addiction requires both pharmacologic management and appropriate counseling. Patients are required to participate in appropriate counseling during the course of the treatment. If you are interested in this treatment option for your opioid addiction, would like to schedule an initial consultation with Dr. Li, please contact us by following the links below. Our staff will be sure to get back to you within 24 hours. or fill out the form on the right, and indicating “Suboxone Treatment” on the “Type of Appointment”. Our staff will contact you within 24 hours.